I had a recent small obsession with pink. 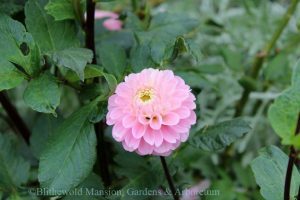 You may notice it in the Rose Garden – particularly with the dahlias. I chose pale pink, hot pink and a few with lavender tones to balance out the mix. I appreciate that we took the chance to use these colors. Sometimes you just have to get it out of your system; however, I won’t guarantee that you won’t see pink in the garden in the future! 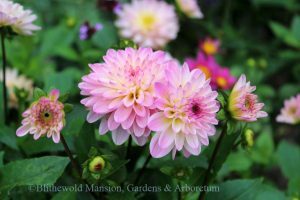 You may recall that I wrote about the Rose Garden dahlias in July. They have been blooming non-stop all summer. Both ‘Elizabeth’ and ‘Stillwater Plum’ have been tiny champions gracing the front of the garden. Although they are starting to show some signs of slowing down, I am impressed with the quantity of flowers they are still producing. True garden workhorses! ‘Elfin’ is another top choice for longevity. 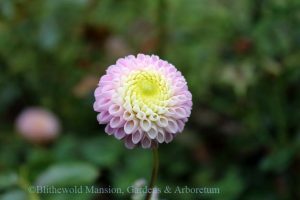 This small-flowered ball-type dahlia has been an excellent bloomer for us. Its similarly sized friend ‘Rhonda’ has seemed to have had its day already and is less floriferous now, though it is still sending up some pretty lovely little flowers. 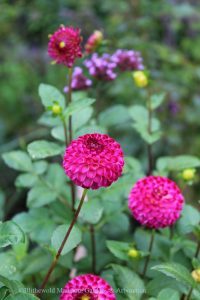 The other two dahlias that grace the middle of the garden have just recently sprung into flower. Both ‘Wizard of Oz’ and ‘Genova’ may have arrived late on the scene, but they are doing their best to make up for it with really beautiful blooms. Now that I have seen these in flowers, I definitely prefer ‘Genova’ to the bubblegum pink of ‘Wizard of Oz’, but I also think that they both work well overall in the mix. 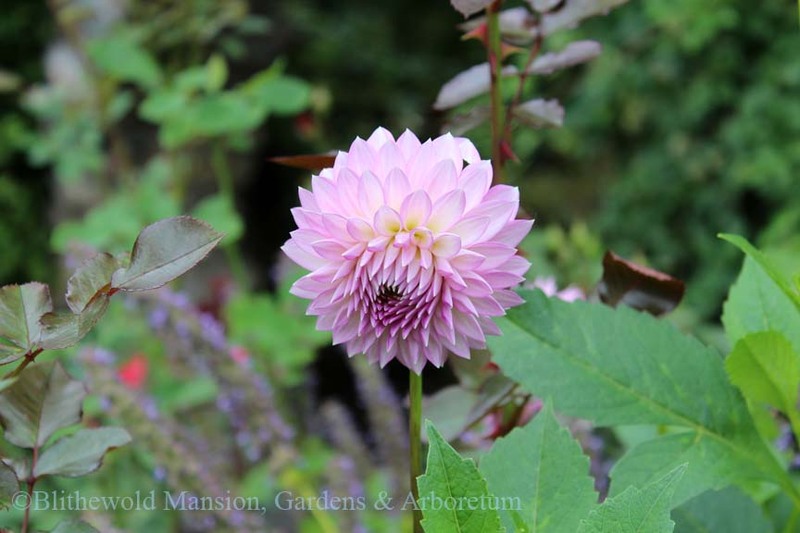 Our tallest dahlia also boasts the largest flowers of the group. This does make it a bit top heavy, which can be tricky to deal with after heavy rains, but we have been doing our best with staking the plants to provide support. The flowers are most definitely worth this extra work. Lest you think the dahlias are doing all of the color work, here are some supporting actors in the garden. Grape-leaf anemone (Anemone tomentosa ‘Robustissima’) has been blooming sweetly in the back of the Rose Garden for weeks. 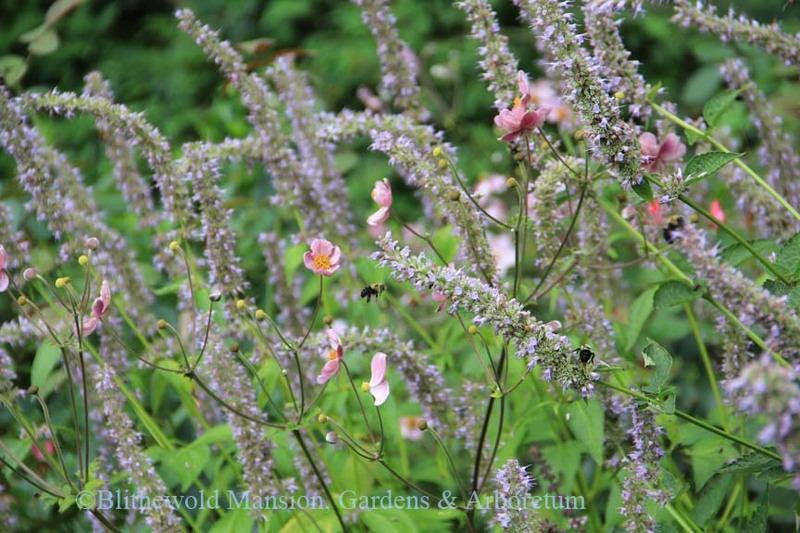 Here they are with the light purple flowers of anise hyssop (Agastache ‘Blue Fortune’). Both of these plants are adored by bumblebees. There seems to be a never-ending hum of activity when they are in bloom. 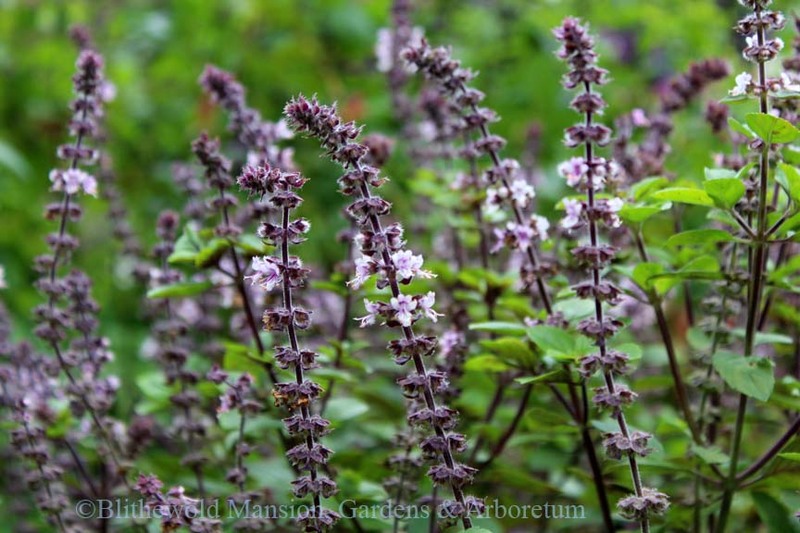 One of our favorite tender perennials, African blue basil (Ocimum ‘African Blue’) is another important player in this mix of pinks and pale purples. It, too, is beloved by pollinators – particularly honey bees. 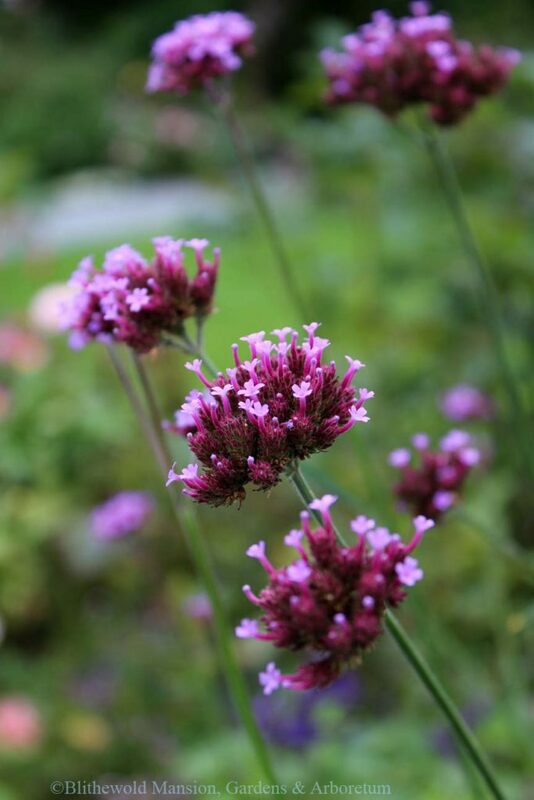 The final supporting player I will mention is purple top vervain (Verbena bonariensis). 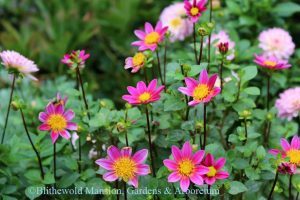 This annual is a generous self-sower in the gardens. We edit out the seedlings to form groups of plants where we want this tall lavender color. Butterflies can often be seen feasting on its nectar (though many butterflies have since started their journey south). 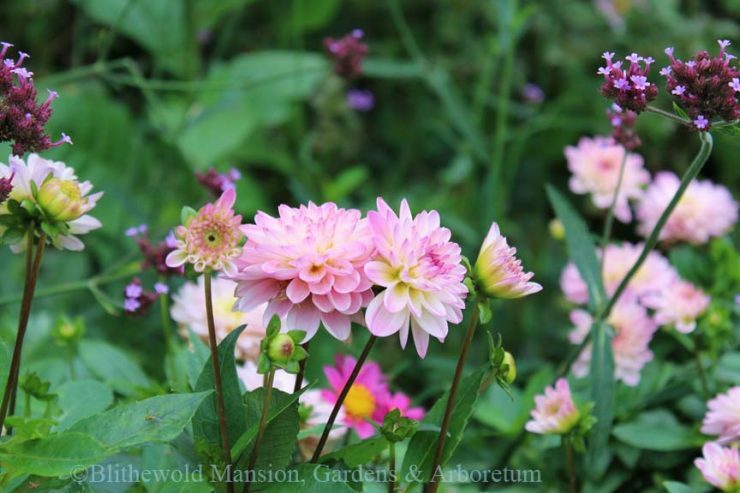 I love it for its prolific blooms and sturdy nature. It might be tall (often grows to 4′) but it rarely flops. And if it does flop, it is easily pruned back into shape. 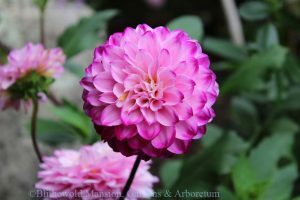 I suppose I chose to write about the pinks and purples to encourage you to follow your own color dreams in the garden. Do you love hot oranges? Gentle blues? Shocking reds? Plant what brings you joy, the rest will fall into place. And if it doesn’t, there’s always next year! Hope to see you in the gardens soon!